Each of the supported algorithms available based on your hardware will show here with details of the mining software displayed. 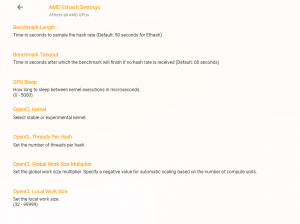 From the below screenshot you can see that Ethash is using Ethminer as the underlying mining software. 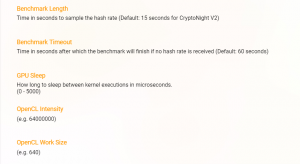 This is important as the underlying mining software will usually suggest the optimal settings on their websites, plus there are also plenty of online forums and reviews providing specifications other miners have trialed before, saving you time. The following settings are universal per each algorithm and can be tweaked independently. Please note that all settings described below will have an effect on all of your GPU’s per machine or rig. Whereas NVIDIA uses its own CUDA parallel computing platform, AMD usesOpenCL. OpenCL provides a standard interface for parallel computing using task- and data-based parallelism.